Tonight's game against the Islanders represented the halfway mark of the Rangers' 5 game road trip and gave the Blueshirts an opportunity to garner against their Uniondale rivals 5 out of a possible 6 points. Some questions sticking in my mind before the game – how competitive would the Isles be given their owner's comments that certain players are now available. 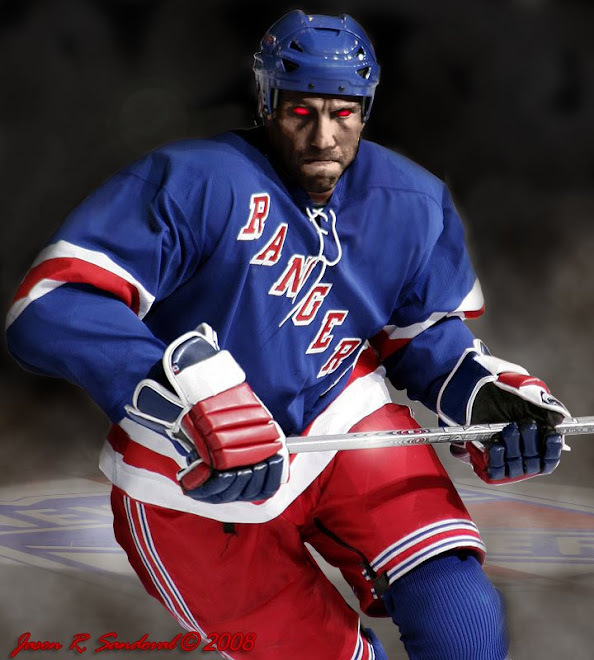 Also, which Henrik would show up – the troubled one from the Montreal game or the more solid one from the Ottawa game? The answers are below. Despite the Isles residing in last place, no one should have expected a rout or easy victory given the Rangers' general scoring deficiencies and propensity of playing down to their competition. In fact, as events played out, it would have been foolhardy to think otherwise. The Isles played hard all night long as evidenced by Tim Jackman pounding the living daylights out of Rosival and Staal with classic clean checks leaving them woozy in the first period. Meanwhile, the Rangers offense did little even when backup goalie Joey MacDonald was replaced by their 3d goalie, Yann Danis. While the Rangers carried the initial play, a penalty on Chris Drury awoke the Isles midway in the first. The Isles proceed to launch a barrage of rubber against Lunqvist out-shooting the Rangers at one point by a margin of 16 to 1 during a period where the Isles out-shot the Rangers, 19-8. The Isles' pressure paid off with a goal by Chris Campoli who snapped a loose puck from the left circle and beat Henrik in the 5 hole with a little over a minute remaining. In the 2nd period, the Rangers asserted themselves defensively and took advantage of 2 power play opportunities. The Rangers' first goal came on a nifty pass from Gomez to Drury with about 7 ½ minutes left in the period. Within 2 minutes, Dawes scored on a 2 on 1 assisted by Callahan. During that sequence, Blake Comeau had driven up ice aggressively looking for a shorthanded chance (recently, every team is taking chances against the Rangers when killing a penalty) but he committed the cardinal sin of missing the net, and the puck sailed around the boards and flew down the ice toward the Isles goal. (Whereas Callahan had done the same on Saturday vs. Ottawa, to his credit he scrambled back to break up a shot opportunity that could have turned that game around.) Here, the Rangers capitalized. Callahan picked up the puck, spotted Dawes on his left and he beat Danis cleanly. This play was the turning point of the game. After that, the Rangers settled into a boring but ultimately effective defensive shell. Final score: 2-1. The Blueshirts, while victorious, demonstrated their season lack of a killer instinct by failing to take charge of a last place team being backstopped by their 3rd goalie. Reminds me of the Ottawa game from Saturday night. Again, despite their lowly record, the Isles proved to be stiff competition for the Rangers. Moreover, coach Renney's observation that the Rangers are a 2-1 team is becoming gospel as evidenced by recent games: 2-1 (shootout loss) in Buffalo, 2-0 victory in Ottawa and the 2-1 win last night. Not pretty, but they are points. Again, as in recent games, the kids were the story -- Callahan and Dawes were noteworthy with their play. 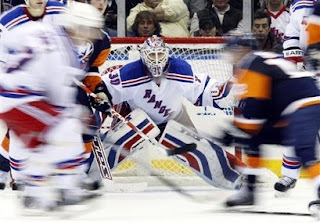 Lundqvist's slump seems to be fading away in the rear view mirror. As in recent seasons under Renney, the Rangers have started the new year by tightening up the defense (albeit against inept offenses) and doing the necessary slot-clearing to give their goalies clear views of the puck. It's still a work in progress. The final 2 games of the road trip are difficult -- the rejuvenated Blackhawks await and then the initial NBC broadcast against the Pens. One is tempted to write that one off as a loss given the fact that the Rangers were awful last year home and away on these Sunday matinees. The Pens did the Rangers a favor by beating the Flyers last night so the Rangers are back on top of the Atlantic. Whew we saw that one coming. What is it about getting the win and being unhappy about it? this was a minor team we were playing and it was desperate on our end through the finish of the game. Poor Lundquist almost had a heart attack in the last 30 seconds. Easier said than done. Last night was the typical rangers-islanders game. I cant wait for the NBC sidney Crosby Pittsburgh penguins lovefest on sunday. I think I'm going to watch the game on mute. 1) Good to get the points they SHOULD get against Ottawa and the island, but the Rangers shouldn't start to feel all that giddy about themselves until they can start to show more offensive constency (a real PP) and beat the better teams in the league. Ugly or not points count no matter who you get them from. Beat what's in front of you is all you can ask. Chicago on the other hand will provide a stiff test for the Blue Shirts. I doubt 2 goals will be enough for a win unless the "King" stands on his head. We'll take the 2 points. Last night vs. Hawks, they earned it. The Ranger Dad's must be proud!